Have you ever wondered if you're just missing God's plan? I've been there. (Actually, I am there now). Have you questioned whether you're making the right decisions about... well, basically anything? The hatred toward your weakness as, even though you're not exactly sure what right always looks like, you know what your doing for sure isn't even related (nope, not even a second cousin twice removed). And trying your hardest to try to stop trying. We're fearing - fearing that we're messing up, fearing that we shouldn't be fearing but fearing that we actually are. We fear that we are weak and that we'll never be strong. We fear that we'll always be striving and never arriving. We fear that we will only fall and be incapable of getting up. We fear that we are missing where we are supposed to be walking in the first place. 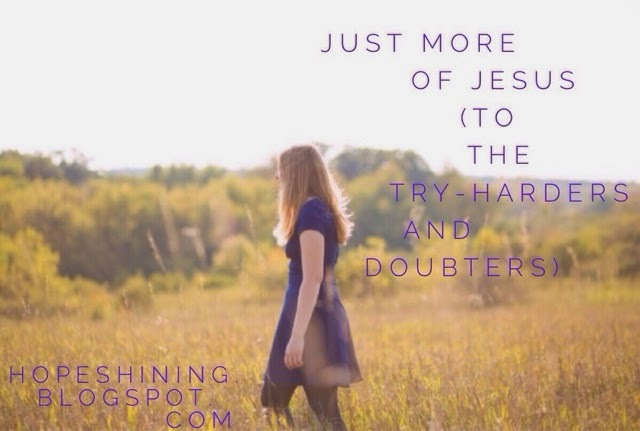 It's a doubting - a doubting that God really is who He said He is and that He. is. enough. He says that there is just no fear in love and that perfect love drives that fear straight outta here (1 John 4:18). Our weakness is actually beautiful, for He says that when we are weak, (oh yeah! ), then, we are strong because His power is made perfect in that weakness (2 Corinthians 12:9-10). Where does this strength come from, anyway? From Him who gives us all the strength we need (Philippians 4:13). We need more of Jesus. maybe we really need more of falling into His faithful arms even as we fail. Maybe we should be still and remember that more often (Psalm 46:10). Maybe we need less of the details and more of Him. Maybe we need to have more faith - faith not only in the promises God has for us but faith in who He Himself is. He is faithful (1 Thessalonians 5:24). He is a Might Warrior (Zephaniah 3:17). He is a consuming fire (Deuteronomy 4:24). He is unchangeable (Numbers 23:19). Just give us more of Jesus.